The Flaming Tender is one of Bowser's special items in Mario Kart Arcade GP, Mario Kart Arcade GP 2, and Mario Kart Arcade GP DX. 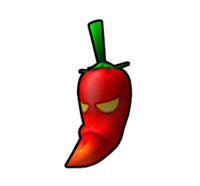 The Flaming Tender is a spicy red pepper with an angry expression. Upon using the item, the user will begin to breathe fire, which they sweep back and forth. Any opponents that get close to the user will get hit by the flame and be brought to a complete stop. In Mario Kart Arcade GP, a variant of the Flaming Tender known as the Flaming Tender+ can be unlocked. This variant increases the duration of the attack. The Flaming Tender is the only close-range special item which is not a melee weapon such as the Hammer or Frying Pan. This page was last edited on February 26, 2019, at 22:01.